Advanced heart failure is associated with very poor survival rates of about 10 % at one year. Treatment options include cardiac transplantation or cardiac assist devices. A left ventricular assist device (LVAD) is a mechanical circulatory support for patients with advanced heart failure. Previously considered only as a bridge to transplant, these are becoming more common as a ‘destination’, and used in patients with end stage heart disease patients who are not heart transplant candidates. Of interest to us, this poor cardiac function in heart failure is often complicated by renal dysfunction, the so-called ‘cardio-renal syndrome’. This blog focuses on the outcomes of renal dysfunction in patients with LVAD and few aspects of renal replacement therapy (RRT) in them. I would discuss this in 2 parts to facilitate coverage of all aspects. I will start with few basics of LVAD that helps in understanding the intricacies of monitoring in HD patients. LVAD consists of an inflow cannula that connects to the left ventricular apex and outflow cannula that connects to the aorta, ascending or descending. A pump connects these two cannulas. An external device, a system controller displays all the LVAD parameters and helps in adjusting the device settings. The pump connects to the controller via a drive-line/percutaneous lead that tunnels subcutaneously and exits the abdominal wall. The power supply is through two batteries that are worn by the patient all the time with adequate backups at their disposal, just in case (see image). The anatomy and physiology of LVAD has changed over decades (see image below), from a pulsatile flow(pf)-LVAD which were big and relied on pneumatic compression system to pull in and out blood through vascular system to continuous flow(Cf)-LVAD which are more compact and use a power operated rotatory element for moving the blood. The complex structure, large size and the decreased durability were mainly responsible for pushing the pf-LVAD from the main stream and making them obsolete. They were frequently placed in the peritoneal cavity and patients were quite troubled from the noise produced by this device. A Cf-LVAD is much smaller and does not have the complex structure associated with its predecessor. They are more durable and are usually placed in the abdominal wall (e.g. Heartmate 2) or in the pericardial space (e.g. 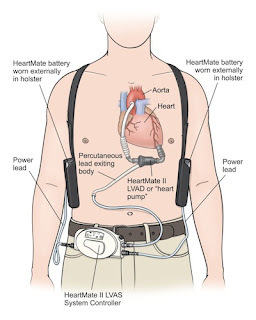 Heartmate 3 or HVAD/Heartware). 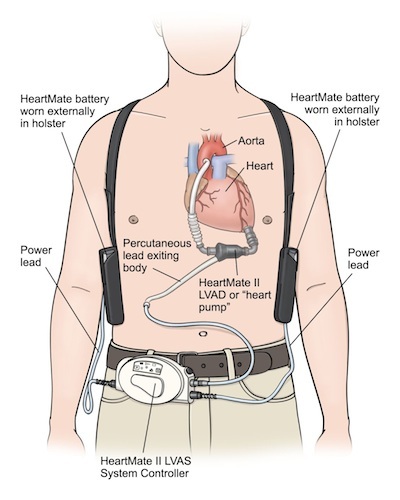 Two subtypes of Cf-LVAD exist depending on the type of rotatory pump. The axial flow pump rotates like a propeller in a pipe where in blood flows parallel to the pump and the centrifugal flow pump is a spinning disk with blades with outflow of blood tangential to the disk. Heartmate 2 and Heartmate 3/HVAD are examples of axial flow & centrifugal flow devices respectively. 1) Pump speed- the only parameter in the LVAD that can be adjusted and directly influences the pump flow. Very high pump speeds may have consequences such a) hemolysis and platelet activation (due to shear stress on cells), b) supravalvular thrombosis (Cf-LVAD increase diastolic blood pressure -> decreases trans-aortic valve pressure gradient -> decreases frequency and duration of AV valve opening -> decreases blood flow through AV valve -> stasis of blood in the supravalvular region -> thrombosis), c) Right ventricular (RV) dysfunction (increased LVAD flow -> more unloading of left heart -> left shift of interventricular septum (IVS) -> increased RV cavity size -> impaired mechanics of RV contraction + pull over septal leaflet of tricuspid valve with regurgitation -> RV failure) and in extreme cases can lead to d) suction event (very high flow rates -> increased unloading of LV -> collapse of LV on the inflow cannula), which can be fatal as it decreases the outflow and causes arrthymia (IVS impinges on the cannula). 2) Pump flow – defines the amount of blood flowing through the LVAD pump in a minute. It can be as high as 10 L/minute. It is directly proportional to the pump speed and inversely to the head pressure (defined as pressure difference between the LV cavity and the aorta). A decrease in preload due to vasodilatation (drugs/sepsis) can increase the flow rate. On the contrary, hypovolemia (e.g. more ultrafiltration in dialysis), RV dysfunction, and tamponade decrease preload and subsequently the flow. Hypertension by increasing the afterload has a similar effect. 3) Pulsatility Index (PI) –a dimensionless variable which reflects the contractility of LV and it varies directly according to underlying LV function with low PI indicating worsening of LV function due to either a decrease in preload (again can happen in dialysis) or progression of underlying heart disease or an effect of negative inotropes on the right heart. During dialysis, it`s safe to maintain the PI. How to monitor pulse and blood pressure in patients on LVAD? Well it`s tricky, as Cf-LVAD has a continuous flow physiology. So the pulse is not felt in more than half of these patients. Definitely scary to see a living person with no palpable pulse! The presence or absence of pulse depends on underlying LV function. And it`s even more difficult to monitor blood pressure. If patient has a radial pulse, we can measure pressure manually or with an automated machine. If pressures cannot be obtained with this, a Terumo device could be used for recording. This device has 2 cuffs- large & small which are more sensitive for low pulse pressure and hypovolemia. If radial pulse is not felt, then the best way to measure blood pressure is with the help of a Doppler. The cuff is tied over the upper arm and brachial artery is localized with Doppler. The cuff is inflated until the Doppler signal is lost. On slow deflation, the pressure at which the first Doppler signal is heard corresponds to the mean arterial pressure (MAP). So in patients with LVAD, we have essentially only one pressure recording, MAP of `x` mm Hg. It`s always advisable to maintain MAP between 70-80 mmHg. High MAP (especially greater than 90 mmHg) is associated with decrease in blood flow through the pump and thrombosis. ACE inhibitors or ARBs are the drug of choice for hypertension control in these patients. Vasodilators are frequently used if MAP is very high. Negative inotropes especially non dihydropyridine calcium channel blockers need to be used with caution as they can impair RV function. LVAD use is ever increasing in cardiology due to the increasing burden of heart failure patients. Its use has changed from being a bridge to transplantation to now being a destination therapy. As a greater number of patients with heart failure have renal dysfunction, LVAD use has implications for the nephrologist as well. A research team led by Jenny Flythe at the University of North Carolina have developed a 9-minute dialysis research education video. Diverse dialysis stakeholders have identified increasing research knowledge among patients and clinic personnel as key to fostering research ready clinic cultures. In dialysis clinics, the video might be shown on screens at dialysis treatment stations prior to the start of a new research study. Clinics can also show the video in clinic lobbies, holding “lobby days” for patients to ask researchers, medical providers and clinic personnel questions about research in general or specific studies. It can also be used in clinical staff meetings to teach research basics, or made available for home therapies patients and their care partners to watch at home. For researchers, the video can help dialysis clinic personnel prepare for facilitating research studies. It can be used as a conversation tool for interested research participants to discuss research perceptions and study information. Medical providers may also find it helpful, to learn basics that enable them to promote research interest among patients. Investigative Team Members: Jenny Flythe, MD, MPH, Laura Dember, MD, Shoou-Yih Daniel Lee, PhD, Jonathan Oberlander, PhD, Antoinette Ordish, MS, and Caroline Wilkie. Presently, death with a functioning graft is one of the most important causes of kidney transplant failure with the leading cause of death being from cardiovascular events. Withdrawing or avoiding steroids to improve cardiovascular outcomes is a controversial issue. Most patients receiving a renal transplant will have long term immunosuppression regimes including tacrolimus, mycophenolate and corticosteroids, as per the ELITE-Symphony trial. Corticosteroids have been used since the beginning of organ transplantation to reduce the risk of acute rejection. However their use is well known to cause insulin resistance and increasing cardiovascular risk and clearly there is a balance to be struck. Avoidance or early cessation of corticosteroids post-transplant is an attractive option. A trial of 386 patient randomized to withdrawal at 7 days or continuation of steroids showed improved metabolic parameters (triglycerides, gained less weight) at the expense of more acute rejection and more worryingly, chronic allograft injury. A Cochrane review published in 2016 concluded that both avoidance and early withdrawal of steroids substantially increases the risk of acute rejection by 58% and 77% respectively, without long term benefits in mortality or side effects, such as infection or diabetes. The review therefore concluded that steroids should be part of long term immunosuppression in all but specific subgroups of patients. Rabbit ATG, tacrolimus, MMF and steroid withdrawal on day 8. Acute rejection rates were low (10-11%) and comparable between all three study arms at 12 months. The study therefore concluded that rapid steroid withdrawal was possible without ATG induction in this low risk setting. Furthermore, there was significantly lower rates of NODAT in the two rapid steroid withdrawal groups; Arm A 39.%, Arm B 23.9%, Arm C 22.7% [p=0.0004]. It has to be noted that the rates of NODAT in the control group were considerably higher than those found in the ELITE-Symphony trial and probably reflects the active investigation for NODAT in this trial as opposed to the self-reporting method used in ELITE-Symphony (see NephJC coverage of HARMONY). It has yet to be seen whether these results translate into longer term reduced cardiovascular risk and mortality. Also as follow-up was only 1 year and late graft injury is a concern with steroid withdrawal, we eagerly await the longer term results of this trial. For now this trial has challenged previous evidence and provided hope that steroid free immunosuppression is possible, and perhaps beneficial, in a low risk setting. This month's nephrology web video from Wash U Nephrology tells the story of the membranous antigen from Heyman nephritis to megalin to PLA2R in 10 minutes. Nephrology Fellows - Nephrology Business Leadership University (NBLU) is in its 3rd year. This is a must for graduating fellows. Read this review from Mona Shaban and Natasha Dave from RFN from last years. NBLU is a unique week long program that brings together a diverse faculty of practicing Nephrologists, hospital and dialysis provider executives, and other healthcare professionals who will share their insights on leadership, the business of nephrology, and the evolving healthcare landscape. Most sessions are held in a workshop format and are highly interactive and individualized. The NBLU team looks forward to seeing you in August! Azathioprine is one of the oldest immunosuppressant medications, which has been used in the field of solid organ transplantation over the past 5 decades. It is metabolized into its inactive forms by the enzyme thiopurine methyltransferease (TPMT). Genetic polymorphisms of the gene coding for this enzyme are common in the general population (~ 10% are heterozygotes causing low enzyme activity and ~ 0.3% cause complete lack enzyme activity). Testing for the enzyme activity is recommended prior to treatment with azathioprine or any thiopurines in children. However, it is not consistently tested for in adult patients who are immunosuppressed with azathioprine for inflammatory bowel disease, organ transplantation or rheumatologic conditions. Genotypic (testing for polymorphisms in the TPMT gene) and phenotypic (measuring levels of substrates and products of the enzyme in RBCs) testing for TPMT are commercially available but the concordance between them is not 100%. Phenotypic testing performed within 30-90 days after a blood transfusion can result in inaccurate interpretation of the results because of donor RBCs influencing the test results. Moreover ethnicity, type of disease, concurrent drug treatment, red cell kinetics and transfusions should be taken into account while interpreting the results of TPMT enzyme activity. Single nucleotide polymorphisms (SNPs) account for the major TPMT low activity variant forms. 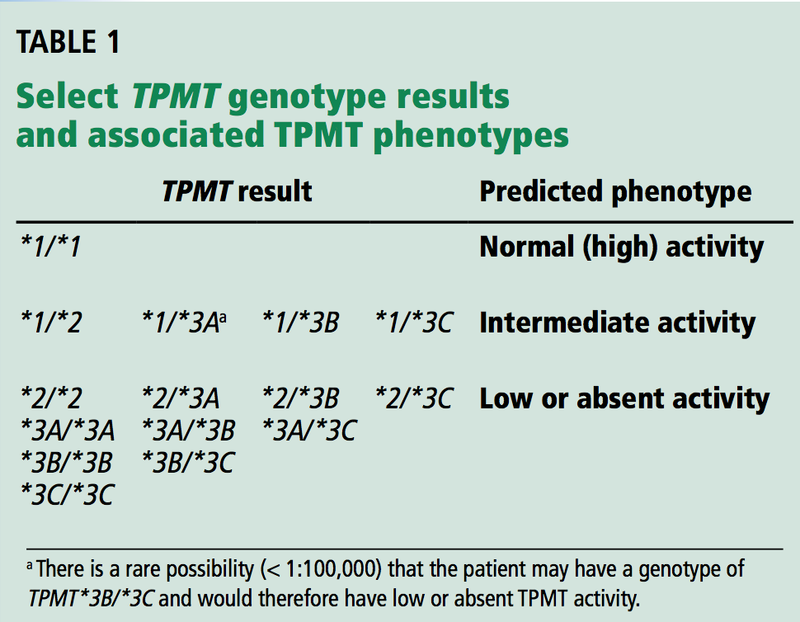 Four TPMT alleles, TPMT*2, *3A, *3B, and *3C, account for over 90% of inactivating polymorphisms. The approximate commercial cost is ~ $200 for phenotyping and ~$450 for genotyping. 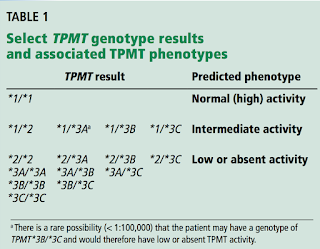 Clinical Pharmacogenetic Implementation Consortium (CPIC) has developed an evidence-based guideline on how to adjust thiopurine doses based on TPMT activity. 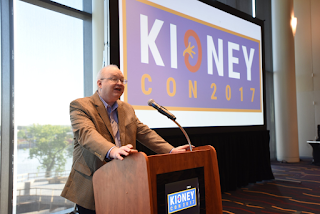 KIDNEYcon is an annual conference (this is the 3rd year) designed to provide updates in the latest advances in kidney care in a hands-on collaborative format. A key component of KIDNEYcon's mission is to build enthusiasm for the field of nephrology among residents and fellows. We also aim to facilitate collaborative research projects among participants of the conference. The conference is a platform for nephrologists and medicine trainees to interact with experts from across the nation and learn about and discuss recent advancements in the diagnosis and treatment of kidney disease. The conference consists of half day workshops targeted primarily to medicine residents, nephrology fellows and early stage nephrologists and a Saturday scientific and clinical conference with broader applicability. 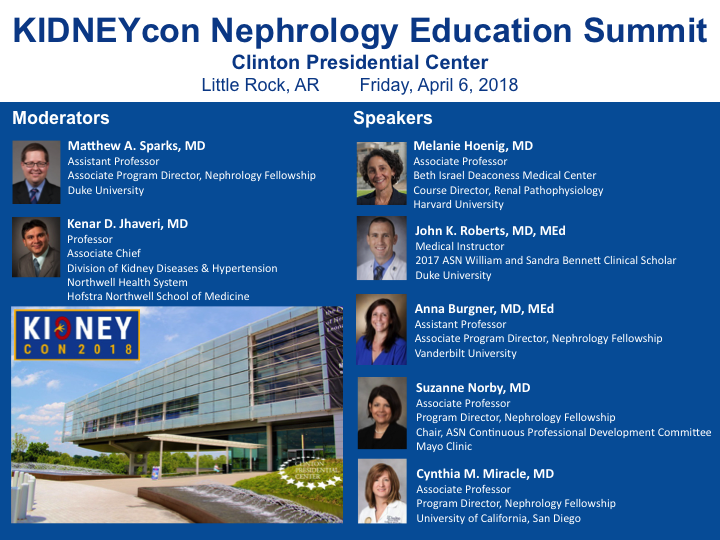 The Friday afternoon session will feature the Nephrology Education Summit at the Clinton Library. Attendees will have the opportunity to tour the library before the Summit. Five speakers representing a wide range of topics spanning from medical student education to fellow education will be presented. This will be followed by a talk from Jeff Amerine focusing on how others can effectively implement educational initiatives at their own institution using LEAN Canvas model. Friday afternoon will feature a trainee Jeopardy competition and a keynote address discussing the physician scientist pathway. 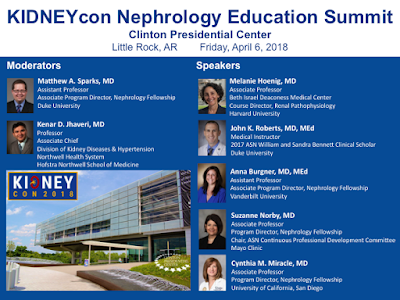 The Saturday afternoon session will sessions on AKI and Liver Disease and kidney stones "Rocks Rock Little Rock"
Attendees are invited to stay on Sunday to discuss research collaborations in nephrology. Please consider coming to Little Rock. I am really excited about this years conference and our goal is to break the mold of the traditional conference. You will leave KIDNEYcon with more confidence and knowledge. Acute oxalate nephropathy is a rare but well described cause of acute kidney injury (AKI) leading to acute tubular necrosis due to the deposition of calcium oxalate crystals within the tubules. Acute oxalate nephropathy can occur in both primary and secondary hyperoxaluria. Primary hyperoxaluria is a group of autosomal recessively inherited enzymatic deﬁciencies that lead to the increased urinary excretion of oxalate. Secondary hyperoxaluria can occur due to increased dietary oxalate intake, increased absorption of oxalate from the bowel (also known as enteric hyperoxaluria), and increased production of oxalate. This mechanism of enteric hyperoxaluria is manifested in several ways, including with orlistat therapy, Roux-en-Y gastric bypass surgery, celiac disease, and Crohn's disease. Increased production of oxalate is mainly due to increased levels of oxalate precursors, more commonly glyoxylate, which is associated with ethylene glycol ingestion, and less commonly ascorbic acid. Oxalate nephropathy has also been seen in association with large quantities of iced tea consumption and most recently with "green smoothy cleanse". Let's review a typical clinical scenario. A young patient with history of alcoholic abuse who arrived to the emergency department with seizures, AKI (creatinine of 35 mg/dL, normal baseline), high anion gap metabolic acidosis, high osmolal gap (20 mOsm/l), oliguria, neurological signs and who strongly denied any drugs-of-abuse or suicidal toxic ingestion. The toxicological serum and urine examination did not show any evidence of toxic substances. No alcohol was noted on breath. The measurement of ethylene glycol serum level was not available. No family history of diabetes or any kidney diseases. Because of accompanying seizures, the patient was admitted to the ICU and treated with CRRT. Radiographic imaging demonstrated posterior reversible encephalopathy syndrome (PRES). A kidney biopsy was performed and showed the presence of several calcium oxalate monohydrate crystals mainly within tubular lumens consistent with acute oxalate nephropathy (Figure above). Eventually, the patient confirmed ingestion of small quantities of car antifreeze solution. Ethylene glycol is a common component of automotive radiator antifreeze solution and is sometimes used as a substitute for ethanol. It can be ingested voluntarily, accidentally, or consumed in a suicidal or homicidal attempt. Ethylene glycol ingestion can lead to AKI from tubular deposition of oxalate crystals and can also cause neurological damage and death. The diagnosis of ethylene glycol intoxication is based on a history of ingestion, clinical examination, high anion gap metabolic acidosis, high osmolal gap, and a measured serum level of ethylene glycol. However, it is often times difficult to ascertain an exact time frame of ingestion or have 100% certainty of consumption. Often times ethylene glycol levels are unknown as well. In this case kidney biopsy is essential in making the correct diagnosis. 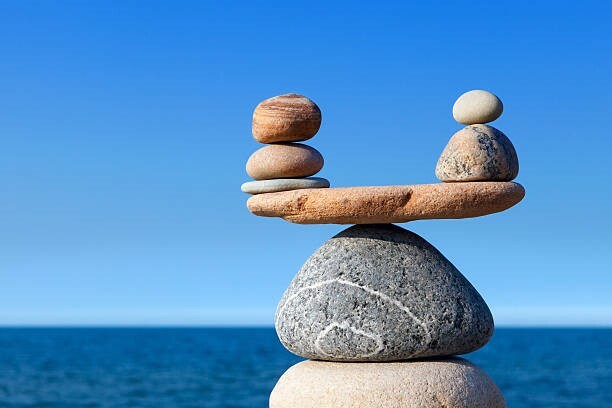 Therefore, a high index of suspicion for this disorder should be maintained in the presence of unexplained metabolic acidosis, hyperosmolality, unexplained AKI, and neurologic dysfunction.